Soft Start facility, with initial torque setting by minimum pedestal voltage, Ramp time settable for setting ramping time, adjustable from 0 to 30 sec. Motor Starts without any jerks. In built Micro controller based Protection for Motor like Single phasing, Unbalanced, Over load, Locked Rotor Short circuit etc. Annunciation for all above fault by digital display as well as indication for Motor run etc. Push buttons for start and stop. No limitations on the number of starts and stops per hour. 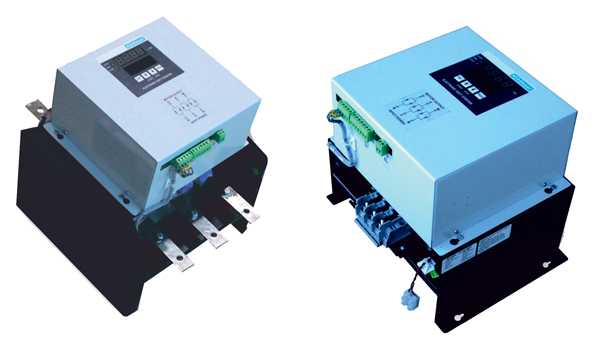 Soft Starter belong to the latest generation of motor starters, incorporation state-of-the-art technology. They are far superior to any of the conventional electro-magnetic modes of starting as they can provide a smooth start, reducing the in rush currents considerably, besides offering several other advantages. Further, the built-in energy saving facility helps in reducing power consumption when the motor is partially or cyclically loaded. The starting current drawn by an induction motor is directly proportional to the applied voltage. The Soft Starter is designed to make it possible to choose the lowest voltage possible (pedestal voltage) at which the motor can be started – the lowest voltage being dependent on the load on motor. The voltage is ramped up from this pedestal level to full voltage in the set time (selectable 0 to 30 seconds). Pedestal voltage and ramp time can be set at site. It is also possible to Provide controlled torque soft start with current limit option. Soft start feature can also be provided, as Optional. Smooth start and Step less Gradual acceleration of motor and consequent elimination of shocks during starting. Reduction in peak motor current during starting. Comfortable launching without any damage. Reduced power consumption and hence reduced Energy bills. No moving parts that can be affected by dust, dirt or other such environmental factors. asy installation and Retrofit capacity (3 wires in 3 wires out) – solid state – low maintenance. Power input 415/440 volts AC + 10% 3 phase 50 hz. Maximum Over load capacity 115% continuous, 150% for 10 seconds and 200% for 5 seconds. Voltage rating of Thyristors 1400 to 1600 PIV. Types of cooling Air-cooled upto 75 HP. Force-cooled above 75 HP. SCR Protection MOV transient voltage suppressors to absorb high energy voltage transients provided acoss the input supply points. RC snubber circuit is provided across SCR to prevent misfiring due to rapid rise of voltage.